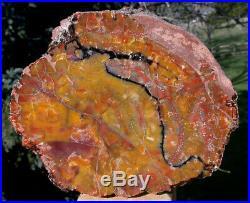 This is one of the most striking and colorful petrified logs we’ve offered recently! I don’t often find good quality, smaller and complete logs from Arizona, but this gorgeous, beautifully colored log was one notable exception. The colors are rich, classic Arizona petrified forest shades that preserved the wood grain better than most in the cut and polished face of this ancient conifer. But the outside husk of this beyond ancient stone is almost as interesting, having preserved the impression of the log faithfully with a very wood like texture virtually all of the perimeter. 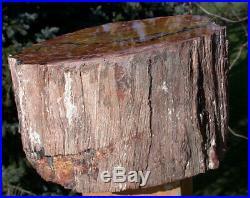 This is a stout and dramatic piece that will show nicely in a variety of settings with a base cut flat to stand the log as shown without the need of a stand. The mirror polish we’ve coaxed from the display face reveals the color and growth rings in a stunning presentation of natural art. The cut face is polished to a mirror perfect finish to reveal an honest glimpse into a story that spans more time than we can begin to imagine! 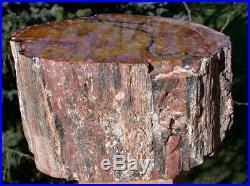 When I first started developing an interest in petrified wood I of course wanted to go out and find some for myself. It wasn’t long before I found myself in Utah kicking around the desert looking for specimens. I didn’t realize it at the time, but the stones I was collecting were both rare and uncommonly well preserved. The best piece I found on that trip is now on permanent display at the Denver Museum of Natural History. I had heard of the Arizona Petrified Forest then, but had never had the chance to visit. Years later I learned that the park itself, while huge, covered only a part of the massive deposit of colorful logs in Arizona. Many of the neighboring privately owned ranches had petrified logs on them and some were actively being mined. The pieces we see in the market today come from those sites, and each location produces slightly different colors – but the most prized pieces have brilliant rainbows of colors that earn them a name to match their display of color. While several species of wood are found, by far and away the most common among the giant trunks are the primitive ancestors to today’s modern redwoods. There is an active debate whether this is a single variety of conifer or several closely related ones, but the 200 million year old mystery is only rivaled in significance by the beauty of these Triassic fossils. The colors are typically very dark and rich in these pieces which makes them compelling display specimens, as is the attractive finish unique to Sticks-in-Stones Lapidary finished rocks! This one has what appear to be spike knots in the cut face that give it a lovely appearance. This one is unique in so many ways that it is a must have for any serious petrified wood collection. This top quality log is not only rare but it’s also reasonably complete. If the timeless mystery of this piece isn’t enough for you, then I’m certain the simple, natural, gemmy beauty of it will be. The high agate content allows this stone to be polished to a liquid perfect, lustrous finish that only the best grades of fossil wood can achieve and virtually all commercial dealers stop investing time in them before they’ve reached their full potential. At Sticks-in-Stones we work every piece like it was going in our own collection – and many do! It should make a beautiful and interesting addition to any collection. 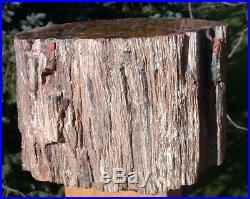 This log stands about 4 1/2″ tall and measures 8″ x 6 1/2 across the polished face. Weight is 15.08 lbs. The item “SiS BEAUTIFUL 15 lb. 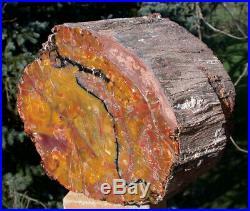 ARIZONA RAINBOW Petrified Wood Log AS GOOD AS THEY GET” is in sale since Saturday, February 9, 2019. This item is in the category “Collectibles\Rocks, Fossils & Minerals\Fossils\Other Collectible Fossils”. The seller is “rockshop” and is located in Beaverton, Oregon. This item can be shipped worldwide.